In 2009 Tommy Wirkola unleashed his vision of undead Nazi soldiers upon the world, Dead Snow. The movie was well received by the horror community, despite not being the most original movie. It was made with energy, enthusiasm, and a healthy dose of respect for the films that inspired it. Wirkola would go on to make an English language studio picture, Hansel and Gretel: Witch Hunters, which was surprisingly entertaining, before returning to his native Norway to make a Nazi zombie movie sequel, Dead Snow 2: Red vs. Dead. This sequel, shot in English (no doubt to cash in on the first one's international success), ups the ante in pretty much every way. It is a success. 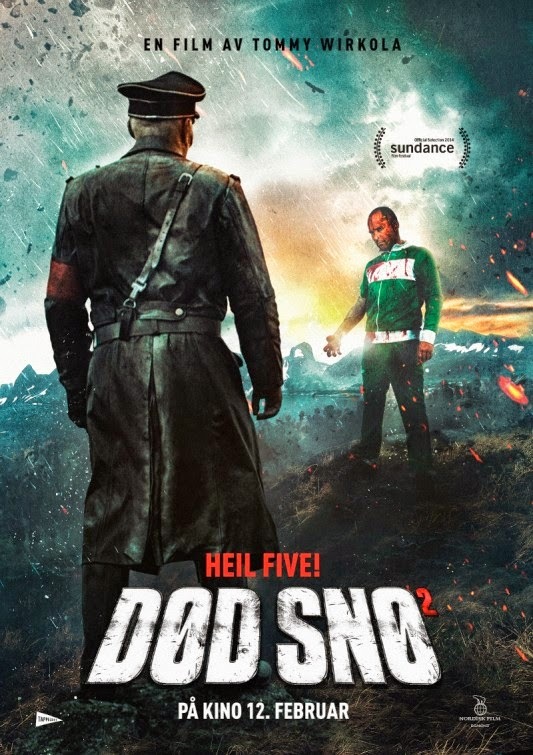 Dead Snow 2 is in no way, shape, or form a serious excursion. If anything, it amps up the comedy that was present in the first. It also includes more blood, more action, more zombies, and more story. Yes, that's right. This sequel builds off what little plot there was in the first and makes it a bit more of an epic battle film. I also have to say that this is a lot of fun. Again, not the most original or great, but there is definitely something about that does the job. Tommy Wirkola understands the idea of entertainment, his goal through all three films of his I have seen is to make you smile, make a genre picture and make it fun. It is all right not to take yourself seriously, it can be cheesy and good at the same time. The sequel picks up right where the first one left off. (You should probably watch the first before continuing.) There is a rcap of how everyone went to the cabin, found the gold, were attacked by Nazi zombies until only Martin (Vegar Hoel) is left. His girlfriend is dead, his arm sawed off. Colonel Herzog (Orjan Ganst) attacks Martin in his car and in the resulting car fight, Herzog's arm is cut off and Martin gets away. We then pick up in a hospital where Martin is accused of killing his friends (who would believe a story of Nazi zombies?). Good news is they were able to reattach his arm! Well, that may not be so good news if you know where this is heading. That's right, the arm was Herzog's! It also tends to have a mind of its own, plus the ability to resurrect other dead bodies as zombies. Poor Martin just doesn't get a break. It falls on our lonely hero to battle Herzog and his growing horde of walking dead who are now on a mission to complete Hitler's orders to wipe out a rebellious Norwegian town. As Herzog's army gains momentum, and a tank, Martin is joined by a clerk at a WWII museum and a trio of American siblings (led by Martin Starr from Freaks and Geeks, This is the End, Adventureland) called the Zombie Squad. Everyone is on a march for an inevitable battle between good and evil, between the living and the dead, and the dead and the dead. Yes, there are multiple zombie armies here. The movie does take on a more epic tone with the number of zombies as well as the end of the Pirates of the Caribbean styled tale of gold coins (in favor of an Evil Dead 2 styled possessed arm). It brings back the orders of the past and the Nazis perceived transgressions of a rebellious Allied town. It also brings in the mass grave of dead Russian soldiers who fought the Nazis during the war. It adds the supernatural element, beyond mere zombies, to introduce the ability to reanimate more dead. Then there is the global quotient with the American trio who have been preparing for this based on the prevalence of zombies in mass media. 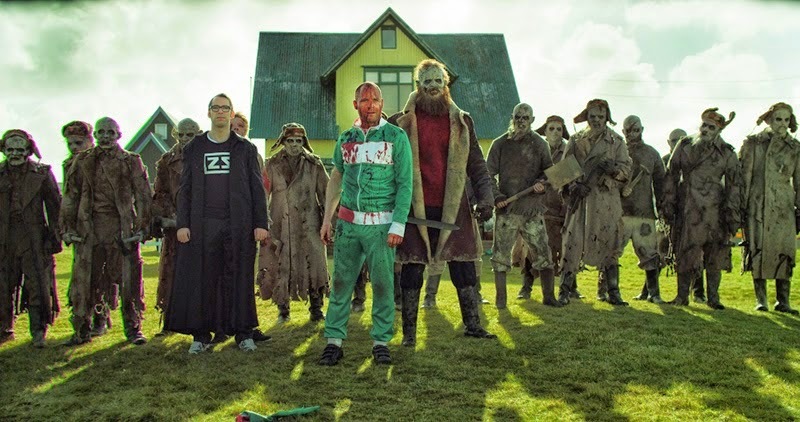 Dead Snow 2: Red vs. Dead is not a movie to take seriously, it is not one to over think, it is one to sit back and enjoy. It is a really fun ride. That rarely lets up. This is designed to be a roller coaster from start to finish and it delivers. 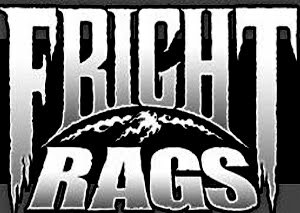 There are plenty of sight gags, blood, silliness, and action to please just about anyone. So, sit down and press play! This sequel outdoes its predecessor. The Blu-ray release features a 16:9 widescreen image and it looks great. Colors are strong and crisp and there is a nice variety of looks from dark and shadowy to very bright white. I did not detect any artifacts or problems, in fact, considering the level of detail throughout, I cannot complain. Likewise, the audio, a 5.1 DTS-HD Master Audio track, is just as good, delivering all the growls, screams, and blood spattering that you would need, while dialogue is always nice and clear down the middle. Among the extras is an international version of the film, which is the movie in Norwegian. It appears to have been shot twice, once in English and once in Norwegian. There is also a short film called Armen, it is about a man who loses his arm, and th replacement has a mind of its own. It fits the set and is a clever short piece. There is a brief special effects breakdown, a Dead Snow Comic book, and the trailer.